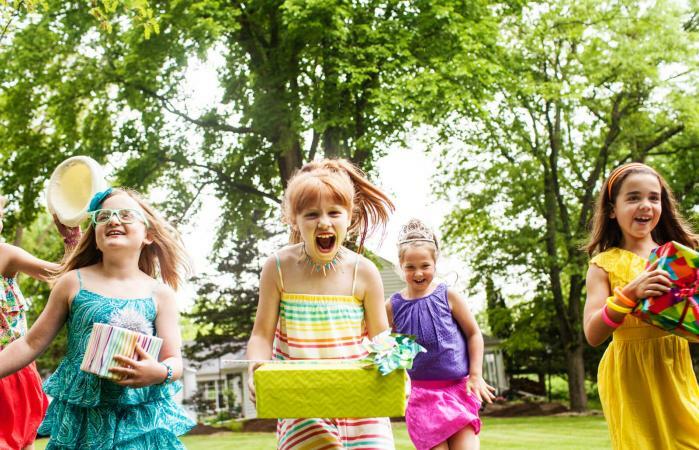 Kids' party games can make or break your child's birthday party. Fortunately, there are hundreds of fun-filled activities appropriate for children of all ages. If you want to ensure that your child's party is a real winner, gather your young guests to play some simple games. Make your child's party stand out from the rest with simple games they've probably never played before. Who knows, you might start the next kids' party trend! This simple indoor party game is great for small groups and doesn't require any setup. Choose a word for each round of the game. Have all the kids close their eyes then tap one child on the shoulder and take them to the other room. Go back to the group and ask each child to say the word for the round while keeping their eyes closed. Then, each kid has to guess, with eyes still closed, who left the room. For younger kids, you may want to use blindfolds. You'll need at least one fidget spinner or the spinner from any child's board game to play this larger group game. Choose one arm of the fidget spinner, it works best if they are different colors, to use as the pointer. Sit the kids in a circle and let each take a turn placing the spinner directly in front of them and spinning it. Whoever the spinner points to when it stops must sit behind the person who did the spinning to form a team. After each child has had a turn, the team with the most people in their row is the winner. This game can be active and use a series of movements or more passive and use a series of words or sounds. Kids will need to start in a circle or a line, standing for the active version and seated for the calmer version. The first person makes two movements or sounds. The next person must copy these in reverse and add two new movements or sounds. The object is to see how long the group can correctly reverse each other's actions or noises. Most kids parties involve gifts of some kind. In this game, the kids have to try matching which gift belongs to which guest. If it's for a birthday party, the birthday girl has to try matching who brought each gift. If the party involves each child receiving a gift, they all have to work together to guess which gift belongs to each child. Make sure there are no gift tags on the presents and you have a list of which wrapping gift matches each child. Kids can sit in a circle and each start with a gift handed to them by an adult. Taking turns, kids change gifts with someone they think has theirs. After each round, you can tell them which are correct and which are not. Make the game harder for older kids by only telling them how many are correct, not which ones. These timeless party games can be tailored to entertain kids from three to thirteen, Any kind of games that are fun and grab kids' attention will work for a party! Everyone loves to do the limbo! All you need is a yardstick and a couple of people to hold the ends. After each child tries to go under the stick once, lower the stick a few inches. Kids are out when they can't make it under the stick without touching it. Simon Says is always fun and can be tailored to fit a number of different age groups. Older children will have more fun dealing with trickier demands while young kids can get by with simple prompts. Remember, if a child follows a command that wasn't issued as "Simon says...," he's out. Kids love to hunt for things. Create a list of scavenger hunt clues ahead of time then make several copies of the list. You can even add some inexpensive treasures around the yard, such as chocolate covered coins, plastic toys, or bubbles. Be sure you have extras on hand so that everyone gets a prize. Fill a homemade or store-bought piñata with candy and small toys. 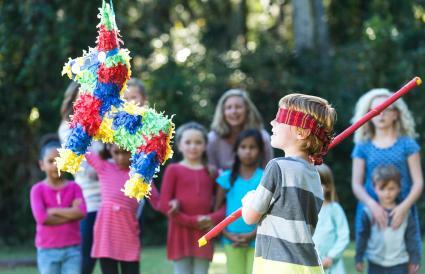 When you begin, you might want to give the kids something light to hit with at first while they are blindfolded, so that each child has the opportunity to hit the piñata before it breaks. Then, give the birthday child a heavier stick, and let her break the piñata. 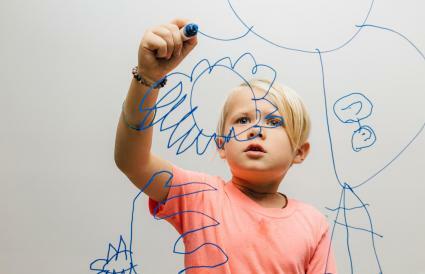 These games are designed to get kids moving in creative ways. Use these when you've got a crowd of young kids or need to burn off that sugar energy after dessert. Children love to move and love music even more. Even toddlers can get in on the action with this easy game. To play, have kids wiggle and giggle to the sounds of silly songs, then, when you turn off the music, they have to freeze until the music starts again. This popular pool game will really get the party started. Get it going by having one person close his eyes. Next, have the other guests scatter around the pool. The person who has his eyes closed must tag the others in the pool by calling out, "Marco" while the others reply, "Polo." This game is lots of fun for little ones, and easy for parents to set-up. All you need to do is scatter some socks around the room. Next, tell the kids that the socks are alligators. Children must then navigate through the socks to the other side of the room without touching the "alligators." This is a variation on the popular game of tag. Be sure you designate a base and declare someone "it." The person who is "it" tries to tag the others; when he successfully tags a player that person must fall onto his back and remain there like a turtle on his shell. In this wet and wild game, children pair up to toss water balloons back and forth to each other. Once a balloon bursts that team is out. Not all party games require running around and breaking a sweat. These brain busters challenge kids to use their thinking caps to win prizes. This hilarious word game is a riot, especially for older kids. Kids get to flex their creative muscles by thinking of super silly words to fill in the blanks of a pre-written story. You can find mad libs for teenagers and even younger children or print out a free short story for kids and cover up a few nouns, verbs, and adjectives. Even younger kids can get in on the action with this group-oriented game. Split the guests into teams. While one person draws clues to a particular word or phrase, his fellow teammates shout out answers until they guess correctly. Divide kids into separate teams and give each team identical puzzles. The team who is able to complete the puzzle first wins. This game's difficulty can be modified to accommodate different ages. Replace game materials with those specific to your theme or holiday. For example, use a tube of candy cane wrapping paper as the limbo stick at a Christmas party for kids. Change the characters in the game to match your party like calling "Watch for the Alligators!" something more Easter themed such as "Dodge the Bad Eggs!" Give all the game prizes and party favors a theme that pairs with your party such as plastic tiaras for a princess party. Liven Up Any Kids' Party! Before selecting games for your child's party, be sure to consider the guests' ages and interests. Party ideas for teens will typically differ from those for preschoolers. However, with a little creativity, you can modify rules on classic games to accommodate the interests of kids of all ages. Consider consulting with the birthday boy or girl before coming up with a final list of party games at the birthday bash.